Now Accepted in Your GREEN CART! Starting April 1, 2019, kitty litter (and the clumps) will be allowed to go in your organics “green” cart for processing. This option is just that, an option. Note: dog feces will not be accepted in carts, this still goes in the regular garbage. East Hants is joining other municipalities that have added kitty litter to their organics processing including; Cumberland County, Colchester County (including Truro and Stewiacke), Pictou County (including the towns), and several throughout the Annapolis Valley. Some of these municipalities implemented programs as far back as a decade. Most kitty litter is designed to clump, which is great when you are doing your daily scooping. But when you add this product to a green cart … that is stored outside … in the rain and snow, you could create a clumping nightmare! The best way to move that litter from inside the house to your cart is with PAPER. Use paper bags or boxboard (like cracker or cereal boxes) to place your litter and then put that right in the cart. This keeps the product nice and secure together. If you are worried about smell from your cart (with adding kitty litter or not), paper is a great way to manage that concern. Reminder: No ‘plastic-looking’ biodegradable or compostable bags are accepted in our system. The kitty litter industry is huge in North America and the options go far beyond the traditional clay-based product. Did you know you can buy litter with the following base product: paper, wheat, corn, pine, bamboo, walnut, coconut, and grass (to name just a few)? Our organics processor (Fundy Compost Inc., Brookfield) is a member of the Compost Council of Canada, and is enrolled in the Compost Quality Alliance Program (CQA). This program provides a more robust and rounded analysis of their product. Fundy Compost supplies the annual compost giveaway event in May and, as part of that event, the analysis of the product is available to our residents. Before the sale or giving away of compost can happen, the product must have samples analyzed at a lab. This analysis will determine the ‘grade’ of compost, which then determines how it can be used. 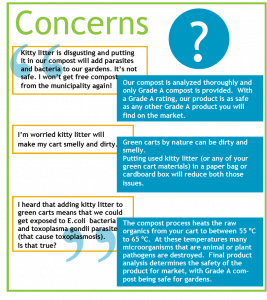 There are two (2) grades of compost: Unrestricted (Grade A) and Restricted (Grade B). Grade A compost can be used in any applications from agricultural lands, residential gardens, horticultural operations, etc. Grade B compost is a restricted use product due to higher trace element content and presence of foreign matter.